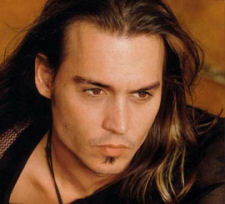 Ironically, Johnny Depp is a Hollywood giant. Not in terms of box-office clout, you understand. He's hardly one of those thoroughbred movie stars who can get a $100 million blockbuster green-lit just by signing on the dotted line. Neither is he in a position to demand percentage points of the gross box-office takings to boost an already sizeable pay cheque. However, at just under six foot tall in his stocking soles, Depp towers over most of the elite Tinseltown club. The only way Mel Gibson could look him in the eye would be if Tom Cruise gave him a footie. Turns out he's flying back to Paris in a couple of hours. This is just a whirlwind trip, ostensibly to promote his current movie Chocolat. The Lasse Hallstrom-directed film—adapted from the Joanne Harris novel—sees him eat lots of sweets and snuggle up next to the lovely Juliette Binoche. But while it impressed in the States—securing five Oscar nominations, including best picture—the sweetie-packed fable received a slightly frostier reception in France when it opened last week. The fact that Depp's character in Chocolat—an Irish river-rat traveler named Roux—is marginalized by 1950s French society has gifted critics a shortcut to one of their favorite riffs: Johnny Depp is The Ultimate Hollywood Outsider. His pursuit of challenging roles over the years—misfits, cross-dressers, orphans with scissors for hands, gonzo journalists—means he has always been on the fringes of the establishment. But does he tire of the label? “They gotta know what to call you,” he shrugs. “They gotta know what to name the product. I've been called a lot worse. And I guess to some extent I've brought it upon myself by doing whatever I've done. But I'm not sure I agree with any of the labels. Outsider? Why? That's a topic that will continue to fascinate me forever—why something is considered outside, outside meaning it's not ‘normal.’ What's normal? Why is it considered normal? Who said so? It's an endless . . .” He casts around for a phrase, before settling on the enigmatic: “It's like a gerbil's wheel.” It's testament to Depp's power—his spellbinding, chocolate-eyed presence—that this doesn't sound even the slightest bit weird. It is time for Depp to leave. As he pulls on a leather jacket and scoops up his whoopee cushion, he makes sure I know that “Robbie Coltrane's one of the finest human beings I've ever met. And I know he's from around your parts.” They've been working together in Prague on From Hell, an adaptation of Alan Moore's meticulously researched graphic novel Jack the Ripper. Fully stood up, Depp actually does look pretty tall, surprisingly broad-shouldered and even more depressingly handsome. But the most noticeable difference is that he's happier because the media junket is over and he's going back to his adopted France to be with his girl and their child. In Britain, we appear to have inherited Madonna. 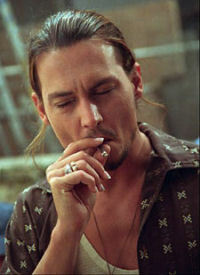 Watching Depp wander amiably off, it's easy to think maybe we got short-changed.